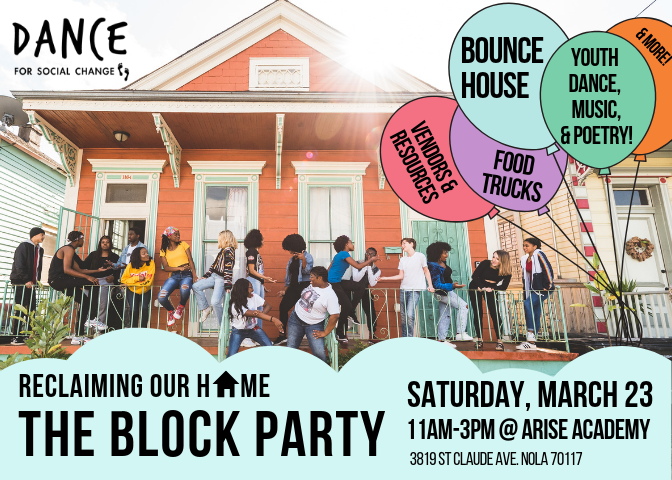 A celebration of young artists in the yard of DG partner school, Arise Academy, featuring 10+ youth performance groups, free dance classes, food, family-friendly activities, and tables highlighting local advocacy efforts. DG Uprising, our teen youth dance company, will premiere their new multidisciplinary performance piece, Reunion, as the culminating event of the DSC festival. The performance combines contemporary, hip hop dance, and spoken word to create a performative reflection, exploring the current effects of gentrification and historical patterns of displacement in New Orleans. Each performance will be followed by small group discussions amongst audience members, led by the youth performers, about what we can do as a community to address gentrification. IN THE KITCHEN: a series of events for young artists to workshop new ideas and collaborate with professional artists, hosted at Dancing Grounds (3705 St. Claude Avenue NOLA 70117). March 22, 7pm : DSC Jam Session, a youth-only event for young people to dance and explore their truth. 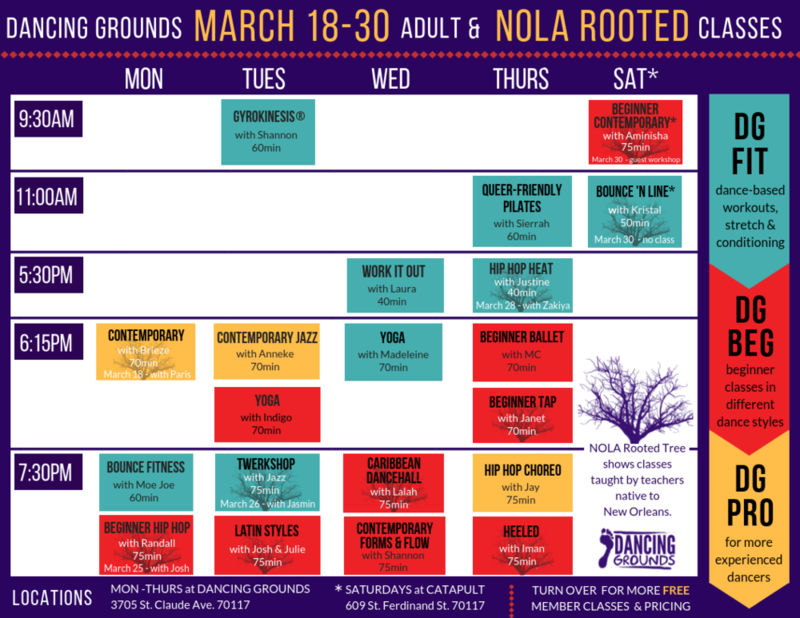 NOLA ROOTED (March 18-28, 2019): a series of adult classes taught by New Orleans native dance artists curated by Chanice Diante and Kristal “M2DaE” Jones. All classes will be sliding scale within a pricing structure that highlights the current and historical economic disparities faced by New Orleans’ native culture bearers, whose work is exported and often exploited by folks that are not from New Orleans. PORCH TALKS: a series of conversations about the role of the arts in gentrification, displacement, and the city’s changing landscape. 6:30-9pm at 2045 Constance Street. March 29 –Arts & Action Panel 6-7:30pm at Music Box Village, highlighting Junebug Productions’ Homecoming Project, New Orleans Airlift’s The Bridge, and Onye Ozuzu’s Project Tool. European Dissent’s Anti-Gentrification Working Group. After the festival, we will continue to offer learning opportunities and public events in an effort to bridge conversations of injustices related to gentrification and displacement. April events will include a partnership with New Orleans Airlift’s The Bridge and Junebug Productions’ Homecoming Project. Interested in partnering and contributing to our advocacy efforts? DG Uprising Company Rehearsals (September 2018 – March 2019) serve as the breeding ground for the development of an original, site-adaptive performance that will premiere at the DSC festival and tour to local community events. During 3-hour sessions on Saturdays led by Chanice Diante Holmes, a cohort of 20 DSC teen participants identify a social justice issue that matters to them and collaboratively develop an original performance that blends hip hop, contemporary, and Afro-diasporic dances, poetry, and music. In past years, students have chosen the following themes: “Breaking Through The Stigma of Mental Health” (2018); “Women’s Rights and Gender Justice” (2017); and “Raising Student Voices: The School to Prison Pipeline” (2016). Participants studied with acclaimed local dance company, KM Dance Project, and visiting artists Urban Bush Women (NYC), Forklift Dance (Austin, TX) and more to further their dance training, choreography, composition, and performance skills. DSC Festival (March 18-31, 2019) is a series of performances and events highlighting the work of DG Uprising, and connected their artistic endeavors with local advocacy efforts. This event includes free dance classes, performances by youth performance groups from across the city, community resource tables, a healing arts village, and more. Throughout the week, we will organize events and speakers connected to the 2019 DSC festival theme. On March 30 and 31, our young artists will premiere their powerful new performance piece at Art Klub. DSC Performance Tour (April-May 2019) will bring young people to perform their site-adaptive work at local ommunity events. Students will engage in dialogue with their peers and facilitate discussions that highlight the role of youth in impacting social change in their community. Past performance tour sites include Southern Rep’s Lagniappe pre-show, the Tulane Black Arts festival, Jazz Fest, DG’s GiveNOLA Get Down, and NOMA’s Taylor Foundation Celebration. DSC launched in 2016 with Raising Student Voices, a series of dance workshops that culminated in site-specific performances in classrooms, hallways, and the cafeteria of Akili Academy. In 2017, the program grew to include weekly workshops and a Day of Action preceding the festival performances. Students presented original works at the Music Box Village with the theme: Elevating The Playing Field: Women’s Rights and Gender Justice. In 2018, the program expanded further with new support from Dance USA’s Engaging Dance Audiences grant program with the theme Breaking Through The Stigmas of Mental Health. DSC has always been grounded in community partnerships and collaboration. Past partners include: KM Dance Project, BreakOUT!, New Orleans Center for Creative Arts (NOCCA), New Orleans Airlift/Music Box Village, Threadhead Cultural Foundation, New Orleans Theatre Association, Design as Protest/Bryan C. Lee, Arise Academy, Women with a Vision, Junebug Productions, Cocoon: Youth Empowerment Project, and New Orleans Youth Open Mic.